Locality: United States, Colorado, Dolores, Upper Dolores River Drainage and Adjacent Areas: San Juan National Forest: Lizard Head Wilderness Area: Lizard Head Trail, ca. 7 air mi N of Rico. Georeference Remarks: I plotted point along Lizard Head Trail at the lowest point within Dolores county. POint is at 11519 ft in elevation. POint is 10.4 miles NE of Rico. Section info taken from NFS map. AC The trail in section 15 is actually called Cross Mountain Trail. Habitat: Montane to subalpine forest and meadow; Engelmann spruce, subalpine fir, and Ribes; south-southeast facing slope. 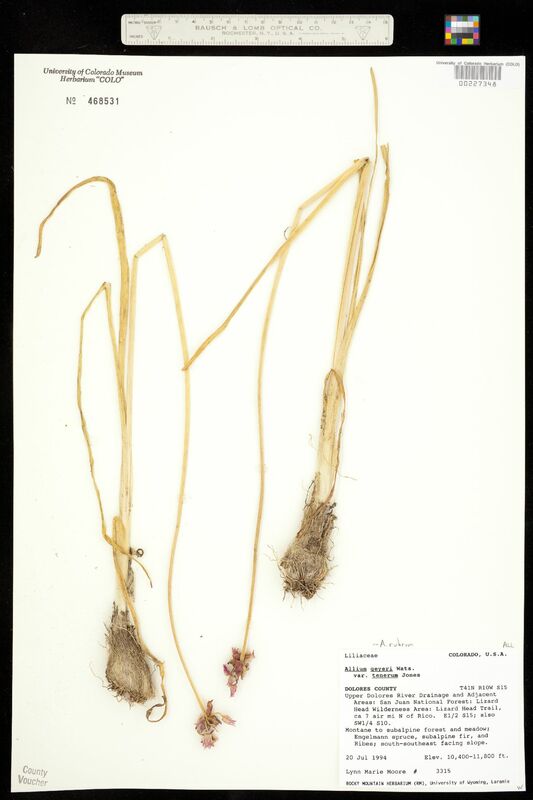 Notes: Original ID as Allium geyeri Wats. var. tenerum Jones. 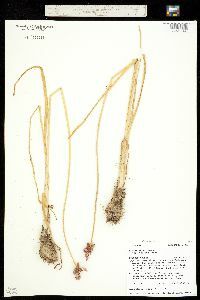 Handwritten note says = A. rubrum. Also SW¼ of SEC10.